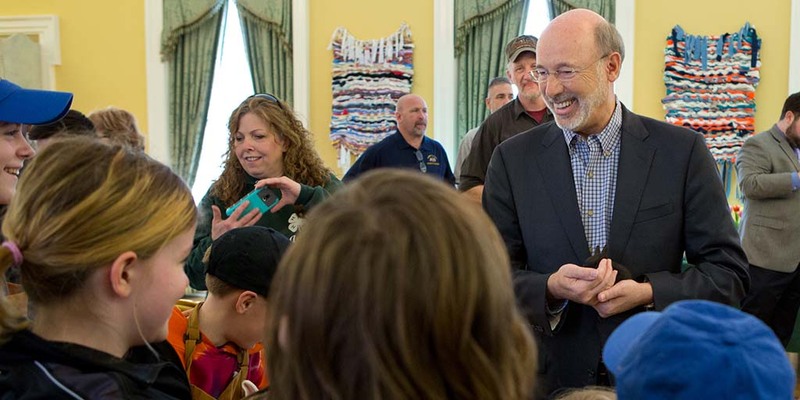 Harrisburg, PA – Governor Tom Wolf and First Lady Frances Wolf today hosted pre-school classes from across the commonwealth at the annual Easter Egg Event at the Governor’s Residence. The event was co-sponsored by Pre-K for PA, a non-partisan advocacy group that supports the expansion of publicly funded pre-k. In his 2018-19 budget, Governor Wolf proposed an additional $40 million to support high-quality pre-k programs in the commonwealth. This expansion would mean access to publicly funded, high-quality pre-k for 4,400 more kids. Studies show that children who participate in high-quality pre-kindergarten perform better in school, graduate at higher rates, and earn more throughout their working lives compared to peers who do not have access to early learning programs. Additionally, children who were previously enrolled in Pre-K Counts outperform their economically disadvantaged peers in third grade math and reading. For more information on pre-k in Pennsylvania, visit Pre-K for PA.